Get even more out of your Bissell Deep Cleaning Machine! The Bissell Hose & Upholstery Tool was designed to be used with the Bissell Deep Clean Machine. This handy tool will allow you to extend the same intense cleaning power of the full machine to your furniture and car’s interior. The Bissell Hose & Upholstery Tool uses a similar brush system to the full machine, meaning that it has the same ability to work deep into the fibers and break up dirt, stains, and odors. The Bissell Hose & Upholstery Tool has a 10-foot-long flexible hose that will give you more than enough reach to clean every inch of your car’s interior! The Bissell Deep Cleaning Machine is a wonderfully effective carpet cleaner, but it does have its limitations. Namely the fact that it is a huge machine that is far too heavy to maneuver around places like your car’s interior cabin. So, if you are looking for the ability to clean your car’s interior just as well as the Bissell Deep Cleaning Machine cleans your carpet flooring, then the Bissell Hose & Upholstery Tool is the perfect tool for you! The Bissell Hose & Upholstery Tool provides just as much cleaning potential as the full-sized Bissell Deep Cleaning Machine. The Bissell Hose & Upholstery Tool has a similar power brush system that is able to penetrate deep into the fibers of your carpet and upholstery. These brushes will work quickly and effectively to break up dirt, mud, stains, and odor causing particles, making them easily vacuumed out by the Bissell Deep Clean Machine’s powerful suction! There are many places in your car that are not easy to reach, like under the seats. Having to work with a carpet cleaner that wouldn’t let you reach under your seats would be very underwhelming. While you may have that kind of experience with other carpet and upholstery cleaners, the Bissell Hose & Upholstery Tool will put an end to that hassle! The Bissell Hose & Upholstery Tool is more than capable of reaching even into the most niche places of your car’s interior. This is thanks to the Bissell Hose & Upholstery Tool’s 10-foot-long flexible hose. 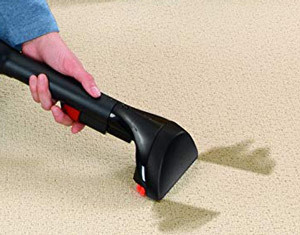 With the Bissell Hose & Upholstery Tool there are no limitations to how clean your carpet and upholstery can be!